Flaunt hair with natural fullness and high-intensity strength against damage and hydrate your strands with Pantene Pro-V Full and Strong Conditioner. As part of the Pantene Pro-V damage-defying PowerFULL antioxidant system, this specially formulated conditioner helps protect and improve hair health inside and out while nourishing each strand. The result? Hair is left buoyant, flexible, and healthy-looking. 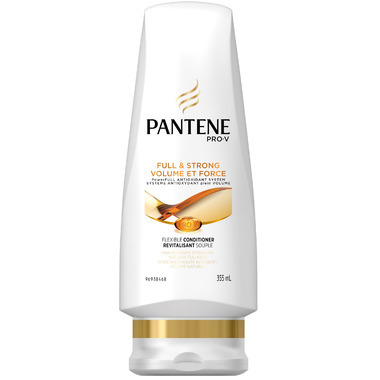 Also try the full range of products in the Pantene Pro-V Full and Strong Collection to help defend against damage and accentuate your hair's natural body. Directions: Massage into wet hair after shampooing, paying special attention to ends. Rinse thoroughly. Gentle enough for use on permed or colour-treated hair. Ingredients: Water/Eau, Stearyl Alcohol, Behentrimonium Chloride, Cetyl Alcohol, Bis-Aminopropyl Dimethicone, Fragrance/Parfum, Benzyl Alcohol, Disodium Edta, Histidine, Panthenol, Panthenyl Ethyl Ether, Citric Acid, Methylchloroisothiazolinone, Methylisothiazolinone.